Agricultural landscapes are dynamic environments which change in response to cropping and trade opportunities, available technologies and climatic conditions. In this article, we investigate farmers’ vulnerability to climate-related stressors and crop price volatility in rural Navarre, Spain. 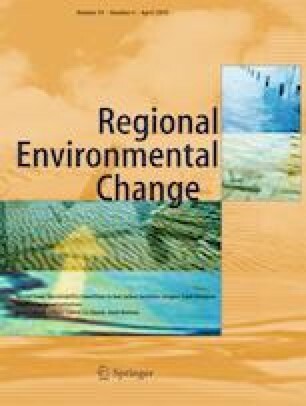 Specifically, we analyse the extent to which livelihood differences and vulnerability can be partly explained by the development of a large-scale irrigation project promoted by the Spanish and regional governments. Grounded on qualitative and quantitative data gathered across 22 villages, we demonstrate that small-scale diversified farmers appear the most vulnerable and least able to adapt to climate-related stressors and crop price volatility. In contrast, more market-driven, large-scale intensive farmers, who participate in the irrigation project, are the least vulnerable to these stressors. We argue that the irrigation project has increased the short-term adaptive capacity of irrigation adopters while establishing the institutional conditions for the displacement of small-scale farming. Therefore, we suggest that farmers’ vulnerability in Navarre can be explained by maladaptive irrigation policies designed to favour large-scale and market-driven agriculture. The online version of this article ( https://doi.org/10.1007/s10113-019-01462-2) contains supplementary material, which is available to authorized users. We would like to thank the insightful comments by Dalal Hanna and H.M. Tuihedur Rahman; Adam Searle for their help in proof-reading the paper. We would also like to thank two anonimous reviewers for their useful comments and suggestions. The usual disclaimer applies. This article has received funds from the European Union Seventh Framework Programme (FP7/2007–2013) under the Grant agreement no.264465 (EcoFINDERS). This research is supported also by the Basque Government through the BERC 2018-2021 program and by Spanish Ministry of Economy and Competitiveness MINECO through BC3 María de Maeztu excellence accreditation MDM-2017-0714. Amaia Albizua also wants to thank the grant for contracts of Postdoctoral Training of the Education Department of the Basque Government. Esteve Corbera acknowledges the support of the Universitat Autònoma de Barcelona-Banco de Santander-Talent Retention Programme and the contribution of this article towards ICTA’s María de Maeztu Unit of Excellence 2015 (MDM-2015-0552).